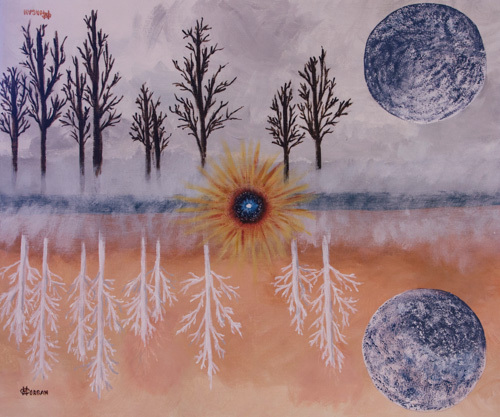 The shared thoughts and artwork of Leslie DiDomenico. Leslie is a local artist from Melrose, MA. 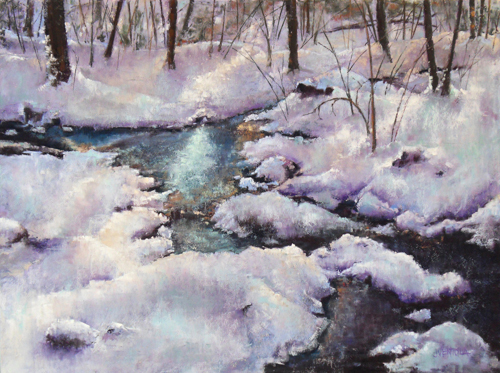 Her work will be on exhibit at the Melrose Arts Festival from April 26-28, 2013. 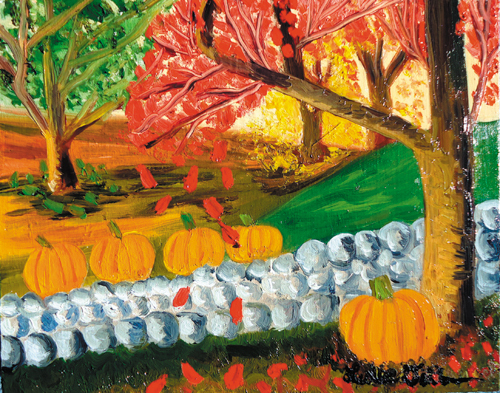 I have always enjoyed making art as a child but High School sparked my passion for painting. I started taking art classes. My father is artistic and he showed me some of the work he did. He also had a set of oil paints, which I experimented with. My first painting was a bowl of fruit. In my senior year of high school, the art room was my second home, which inspired me to go to art school. I attended Montserrat College of Art and graduated with a BFA with a concentration in Illustration. My love for landscapes evolved in my experience there. I studied abroad in Viterbo, Italy. This was where I discovered myself as a landscape artist. Since then, I have gotten a Master’s degree in Art Education from Lesley University and have been teaching at St. Joseph’s School in Medford. I continue to paint landscapes in my free time. Q. What inspires your work and the images you decide to capture? I have many paintings of places I have been to. My usual process is to capture the photos myself and use them as reference to paint from. I am also inspired by pictures in books or online. Once in a while, I will imagine a place in my mind but I typically like having a visual. Also, I have done work on-site outdoors, but dealing with environmental conditions can be very distracting. I would describe my style as expressive, colorful, textural, emotional, and sometimes mysterious. I find a comfortable painting spot indoors. I must put on music to contribute to going into my “painting zone”. 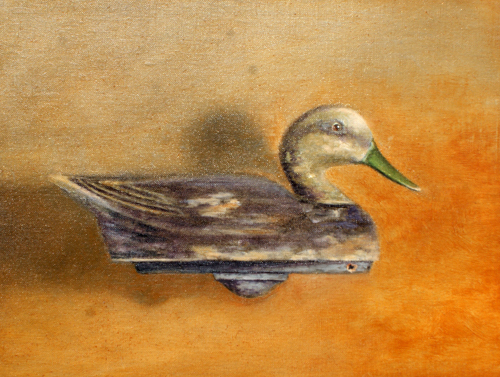 I use water-based oil paints. I begin by using one color mixed with water. I set up a line drawing with that color. I then begin to fill in areas with that one color to create shapes. The color chosen is always significant to the colors I wish to use overall. I then fill in all the shapes with the appropriate colors of choice with paint and water. After, I go over the areas or shapes with lights and darks with thicker paint (water based oil paint mixed with stand oil). I make physical texture with the paint and create the feeling of texture for natural elements such as; trees, grass, etc as well. Q. What do you hope to communicate through your paintings? I want to share my experiences and my interpretations of nature but also I want people to create their own connections when viewing my work. Familiarity and memories may emerge or there might just be a love for a beautiful place. Q. 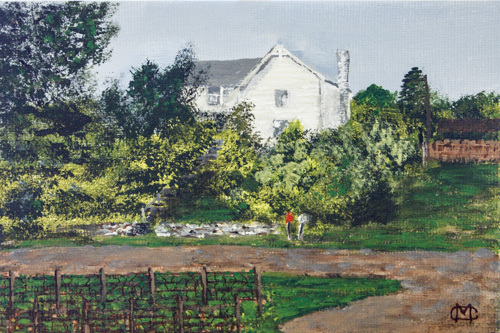 How have your paintings transformed over the years? I started painting with oil paints in art school but switched to water-based oil paints after graduation for health purposes. I have also grown a passion for trees over time. Some of my recent work highlights trees as opposed to a full landscape. Q. What importance does your work hold in your life? What advice would you give to other emerging artists? It’s a meditating and soothing experience. I am able to go into a “painting zone” and enter into my own world. It makes me happy! I tell my students to believe in themselves and to always follow their passion. Never give up! Trees have become more of a focus in my work. I find them interesting. I appreciate their growth and their impact on survival. I am very drawn to branches. I can get lost watching them move, twist, and turn about. 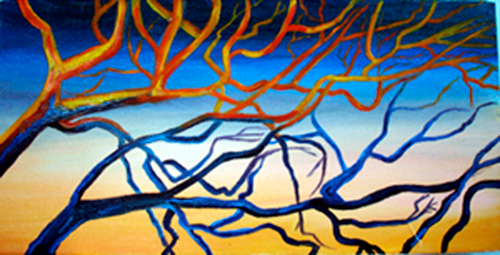 The trees in my work can be natural in color but sometimes will change according to the mood of the piece or the mood of me. Sometimes the illustration side of me emerges. 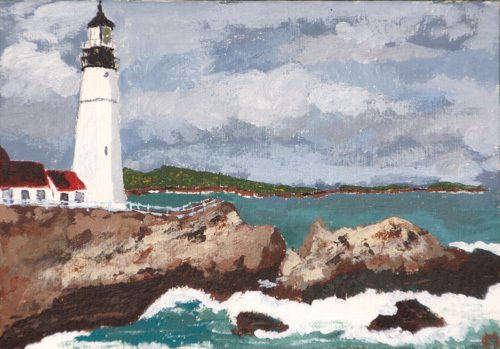 I make calendars, cards, tote bags, mugs and other retail items with my paintings printed on them during the holiday season. The shared thoughts and artwork of Jeff Ventola. Jeff is a visiting artist from Danville, NH. 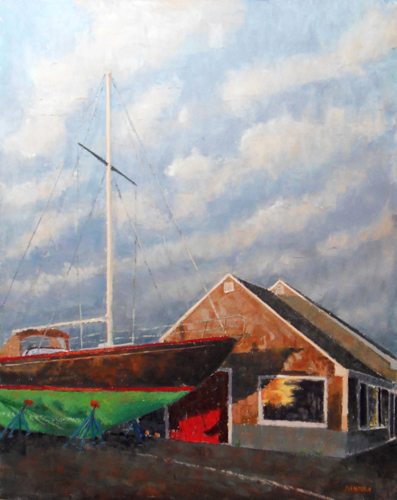 His work will be on exhibit at the Melrose Arts Festival from April 26-28, 2013. Art is my life and I didn’t realize that until I resumed in 2008. I’m sad I let it get away as long as I did, but I’m happy because it has given me motivation that I did not have before. It showed me something about myself…something about my character. It showed me how important it is to stay with something that means so much to you…never let anything take you from it. Painting is my way to express what I am feeling…It’s a part of my soul, it’s who I am and that’s what I try to put in every stroke…a part of me. My instructor is very inspirational…her passion for the arts drives me to want to be better. She is a phenomenal artist who is also the person responsible for getting back into painting. I get my inspiration from many different places….Different subjects inspire me…beaches, clouds and beautiful sunsets. Q. In your bio you mention that you had once taken a 15 year break from your artwork. How did that break influence the art you create today? 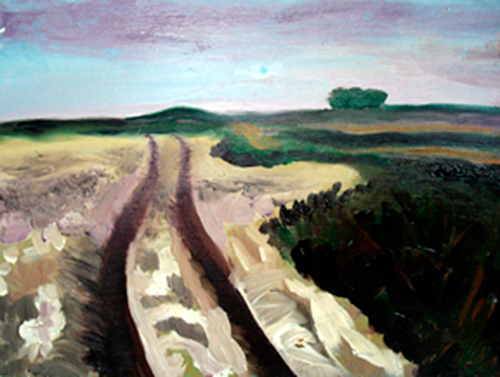 Are your current paintings consistent with your earlier work? 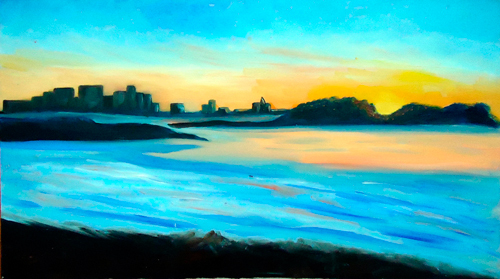 It’s actually more like 18 years…I stopped in 1991 to do other things and in 2008 my good friend who is also my instructor said to me “you’re so talented, what are you doing?” From that day, I ordered oil paints and pastels, enrolled in her class, and have never looked back. That hiatus opened my eyes to how much I love art and enjoy sharing it with other people. My current work is completely different than my earlier work. Not just in subject, but medium. I was an illustrator and I painted with water color primarily still life now I paint only with oil and pastel mostly landscapes. Technically i’ve only been painting since 2008…I’d love to know where I’d be had I not left for so long. My creative process begins with finding a subject that inspires me…once found, I decide which medium would suit it best and which one I feel could execute best for the subject. Once a decision is made to go with pastel or oil, I will either tone my canvas or do a quick local color block in regardless of the medium. With oil, I primarily paint on linen and build my layers thin to thick. With pastel I will lightly layer the pastel usually on Kitty Wallis sanded paper. This paper is similar to sand paper and can accept aproximately 25 layers of pastel. Once the tooth is filled you are able to really push the pastel around and achieve a very painterly affect with the pastel. I try to use Terry Ludwig or Diane Townsend pastels. When I paint with oils, I will work on a section, bring it up to one level and move on to the next section bringing it up to a similar level while not finishing the section completely. This takes much more time, but gives you much more control while painting. Once the painting is complete, I frame my own artwork and hang it in my studio or submit to an upcoming show! Q. As artists, what do you think drives us to capture what we see? I’m driven by the challenge of trying to paint something I feel will be difficult for me. 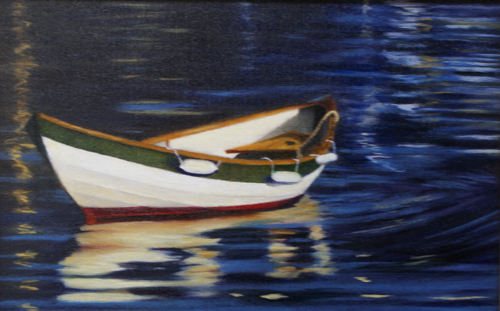 It’s much more gratifying knowing you’ve completed a painting that was a challenge to begin with. 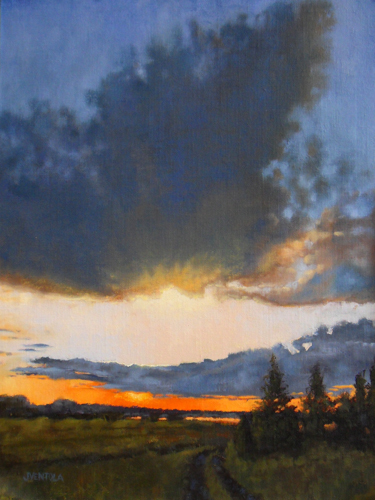 For example…I often struggle with clouds so I I know if I paint clouds and they look satisfactory then it’s a wonderful feeling in the end. Q. What do you hope to share through your artwork? I’m a very private person…I hope my art allows people to see who I am and that there is a side of me that they may find simple and intriguing. My art reflects who I am and allows me to express what I’m about. I am very intense and wear my heart and emotions on my sleeve. I put a lot of that in my art by using dark colors, hard strokes, and sometimes contrasted with soft strokes and simple subjects. Q. When painting, what is the most important element of the piece that you concentrate on? I try hard to concentrate on the values of my subject matter. If your values are incorrect it can throw the whole painting off from start to finish. Q. 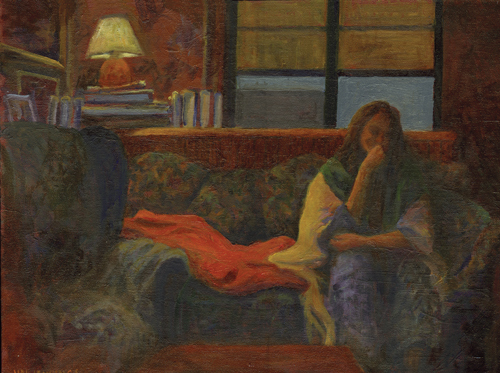 Your portfolio consists of oil and pastel works; what influences your choice in technique on a given day? When I resumed painting I purchased a set of oil paints and a set of pastels and truly had no idea what I was doing. 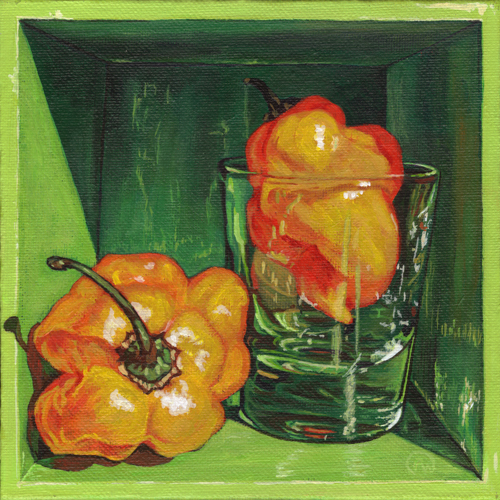 My first oil painting was an apple which ironically sold at last years Melrose Arts Festival and to this day is one of my favorites….I’ll never forget it….it had TONS of paint on it, it was a small 6×8 and literally took 5 weeks to dry! 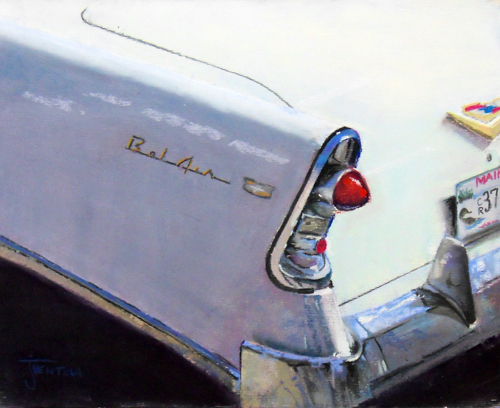 Pastels are much easier for a life style on the go…you can leave them out, grab a stick, throw a splash of color on your canvas and run out the door. There is no paint mixing, cleaning brushes or harsh odors. Today when I look at a subject many things come in to consideration…from what size would work best, to how much time do I have, also where my confidence level is with each medium relating to the subject, which medium do I feel will benefit the subject matter and allow me to produce a high quality piece…literally down to do I have the right color pastels or material in either medium. The subject matter will also dictate how I approach the painting once I decide which medium to paint with. Does it require an underpainting, what type of texture do I want the finished painting to have. 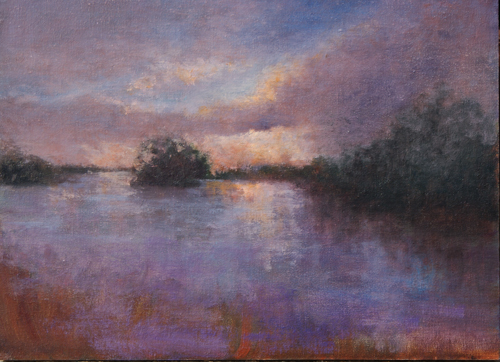 For example, I have a much easier time creating clouds in pastel than I do with oil paints. You don’t have the color control in pastel as you do in oil. Oil paintings take me much longer because I still have much to learn regarding paint mixing and medium. I try to work on a painting in each medium at the same time. They both compliment each other if you continue to paint with the same technique in mind…paint shapes, values and color. When you follow this fundamental you see things in one medium you didn’t necessarily see in the other which in turn helps you become a more well rounded painter. 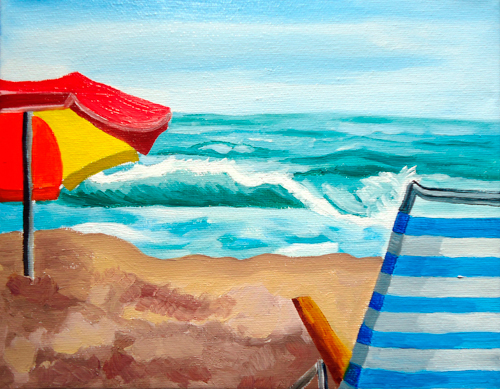 I try to paint with an impressionistic style with a hint of realism. This gives me a little more freedom with my strokes, but still allows me to keep some detail which I really enjoy. Q. What is the experience of painting in “plain air”? Outdoors and painting…what’s not to love! I really enjoy it, but it is very challenging and very different from painting in a studio or from a photograph or still life. The light changes so dramatically so there is no room for second guessing what you see. You’ve got to be very sure of your colors and values and have the confidence to put the stroke down and move on to the next. 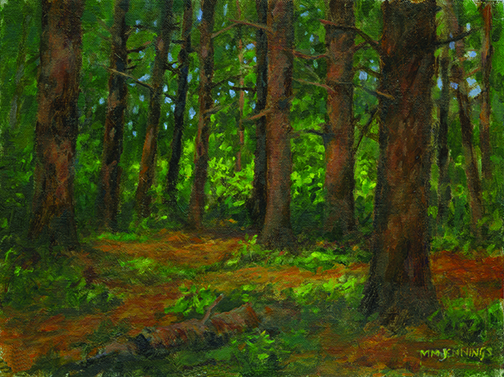 I’ve only been plein air painting about a dozen times and they have all been wonderful learning experiences. 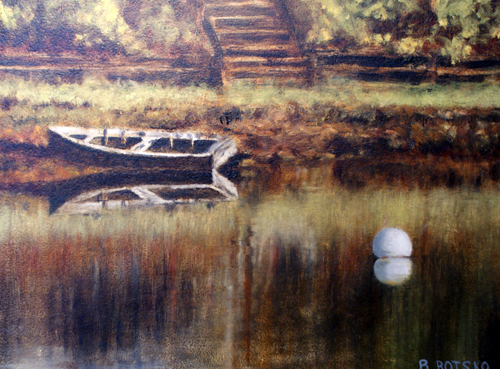 Last year I sold a painting right off the easel while painting outdoors in Amesbury! This is where I developed a love for creativity. It shaped me at a very young age. It showed me it was ok to be different…to express myself artistically was something I was always comfortable doing. It showed me it was ok to to be proud of everything you do. I played sports, and many other things, but when I was done I couldn’t wait to come in and draw, make something out of an milk carton, color, model with clay…anything I could get my hands on. Ironically painting was one of the things I did the least of. Q. What words of wisdom would you give to an artist that hasn’t picked up his/her paint brushes in a while? Don’t be afraid…Don’t let anyone or anything drive you away from something that is truly a part of you. Being away from my artistic side for so long has left a void in my life, I can never get back. One of the only regrets in life I have. My current work reflects the things I love. From figures to animals, boats to cars I do anything that looks challenging and will help improve my skills. 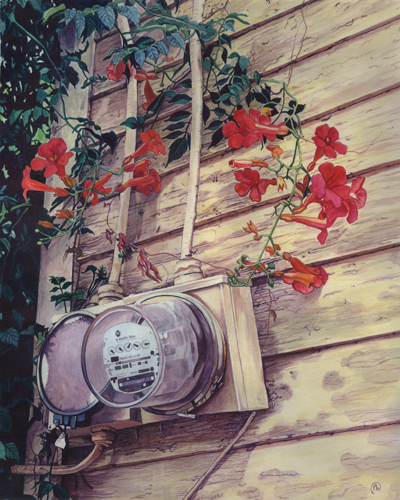 For example…one of my goals this year was to get my oil painting on the same level as my pastel work. Currently I feel I’ve achieved that. More specifically I wanted to refine my cloud painting ability. I’ve liked them, but never loved them…they are so challenging…always moving…so many shapes, color temperatures, values…just beautiful…they deserved to be captured accurately. I’m still working on that, but am in a much better place now than I was six months ago. I look at some of my early paintings and I am VERY proud of my progress in five years. 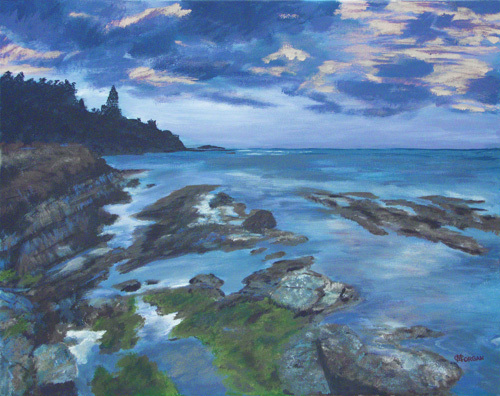 When I began painting in 2008, I relied mostly on instinct I’ve come so far and learned so much. 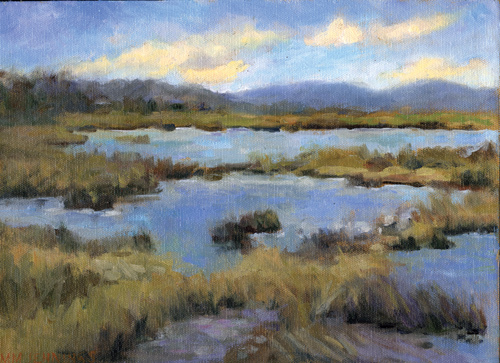 There is so much more to painting than just putting a stroke on canvas…so much to think about, so much to absorb…I take class two days a week and I continue to learn. I’m driven to succeed and have the passion and motivation to get better. As long as I have that I feel I will continue to grow. The shared thoughts and artwork of Brent Rotsko. Brent is a visiting artist from Merrimac, MA. 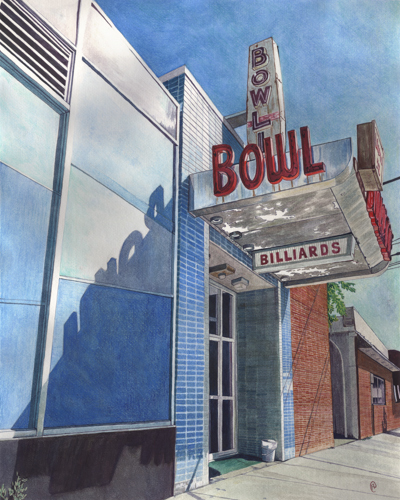 His work will be on exhibit at the Melrose Arts Festival from April 26-28, 2013. 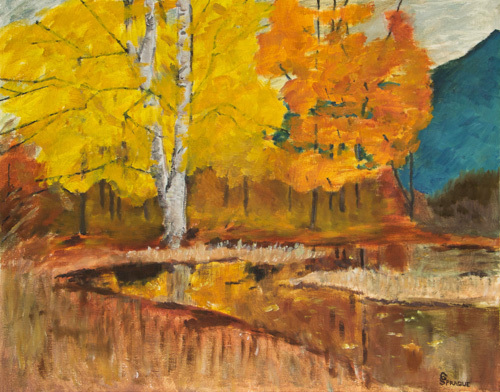 What inspires the landscapes you choose to capture in your oil paintings? I will be riding my bicycle, driving my car, or taking a walk and something will grab my attention. It may be visual or a feeling that comes over me. 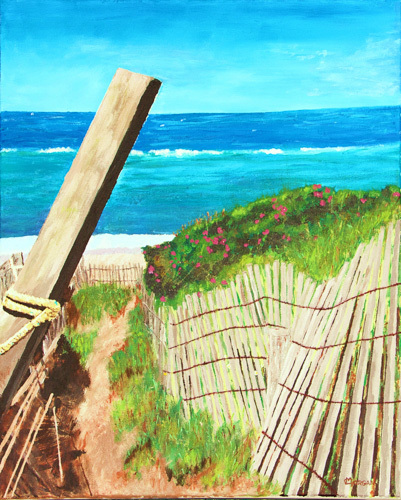 I love the feel, smell, and taste of salt air, so it’s not surprising that many of my paintings revolve around the New England sea coast. When I recreate the scene on canvas I relive those feelings and am brought to a place of peace and comfort. In your bio you mention the influence of growing up watching your mother paint. How did she shape your appreciation for art? I had very little understanding of art as a child, but could appreciate that my mother was always happiest when behind her easel. I remember having great interest in following how my mother’s sketches evolved into beautiful paintings. In those days my doodling on book covers, and attempts at art were considered daydreaming, and a sign of not being focused. My real appreciation and understanding of art came many years later when I decided to follow my dreams. Does your work resemble the painting style of your mother? Though there was no formal instruction by my mother I do see similarity in our work. I believe observing her work influenced my choice of medium and style. Being a self taught artist my process is continuing to evolve. I take lessons and workshops from Artists I respect and admire, such as Robin Thornhill, Todd Bonita, and Donald Jurney. I attend many demos and visit museums when ever possible. My library of art books continues to grow. Most importantly I paint as much as possible. Is there a consistent artistic perspective maintained between the carving of model ships you use to create while at sea as a Merchant Marine, to how you approach your paintings today? As the capture of boats continues to be the focus. I can only describe the comparison as this, both are a way to express my love for the ocean and put me in a place where time stands still. What seems like a minute turns out to be several hours. I lose complete sense of what is around me. How is your artwork a reflection of you? The shared thoughts and artwork of Margery Jennings. Margery is a visiting artist from Amesbury, MA. 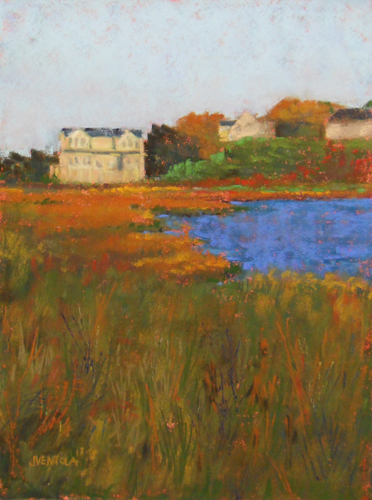 Her work will be on exhibit at the Melrose Arts Festival from April 26-28, 2013. As a child I was always drawing. I got my first set of oils when I was about 13 and have been painting most of my adult life. I worked as a graphic designer for many years and painted around the edges, so to speak, of my regular jobs. For the last six years I’ve been able to take painting front and center. Q. The majority of your work is of landscapes. How do you connect with nature and how do you reflect it through your work? I grew up in the woods, in a rural area. As far back as I remember, I felt connected to those surroundings and still have a powerful emotional response to the natural world. I hope some of that emotion comes through in the paintings. I think about the vulnerability of that world. Most are painted on location, and the immediacy of place–of sounds, smells, wind, temperature and light–all affect me as I work. Standing quietly and painting in one place is like bearing witness at that specific place, at that moment. With any luck the painting allows me to capture something of that numinous quality and share it with the viewer. Q. While painting do you see and feel the world differently? I think perhaps it’s the other way around. I paint because I see the way I do. I will see something visually arresting and it stops me cold. If I’m lucky I can stop, or get back there with my paints; otherwise it remains simply a sharp intake of breath, a vivid memory. There is, though, an almost meditative state that happens when I am painting: I lose any sense of time, and hours can pass without notice. It is an intense and focused process. I’m seeing in three dimensions, converting it to a flat surface, trying to hold on to what caught my attention in the first place. For it to work it also must convey what the painting is about, that emotional response, not necessarily what it is of. There’s a difference. Q. 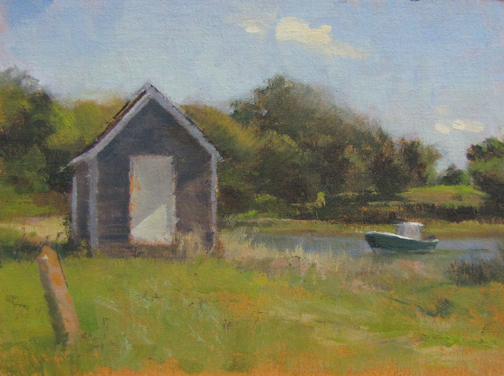 Is there a particular location or time of day you tend to paint at/in? I seem to like times of long light: the shadows of morning and evening can help emphasize or dramatize a subject; the hard light of midday is tough for me. In the studio I have painted at almost every hour when the impulse becomes irresistible. Often I will wake early in the morning with a technical problem nagging from an unfinished work and go into the studio “just for a look.” It’s a good way to get odd colors onto a bathrobe. Q. What details of your work are you most particular about? (color, paint strokes, lines, etc)? Painting for me is an endless learning curve. I love playing with color, but “color” is an opinion–infinitely variable. I’ve enjoyed working with a limited palette–a couple of earth colors, black and white–and seeing how much you can do within those constraints. Composition bedevils me, but I feel it’s the key to everything else. When you walk into a gallery you may see something from across the room that speaks to you immediately, even before you know what the subject is. You then walk closer to get a better look: that’s composition. I think about edges in a painting, but as they contribute to the composition; I rarely pay any attention to paint strokes. They take care of themselves… or not. Maybe if I get to a different level of accomplishment I’ll decide that paint strokes are everything. It’s all process. Q. To someone enjoying the sight of a landscape, what words of wisdom would you share? I will probably always enjoy painting outdoors, but I have been doing other work in studio as well–I like painting figures and faces; I’ve also experimented with mixed media and different themes. I feel it’s about the process of creating, and the process of learning, rather than outcomes. I could probably go in a very different direction if I found a good reason to. A lot of people come up to me and confide that they either wanted to paint, or did and gave it up, or “can’t” paint but would like to. Don’t listen to the negative messages in your head. No one can judge you. Never be afraid to take up an artistic pursuit at any age. Take a class. Watch a video. Go to museums. Draw something simple like an apple, or an orange if the stem intimidates you. Look at paintings (or sculpture or whatever). Take it all in. If you have the desire, find your voice. 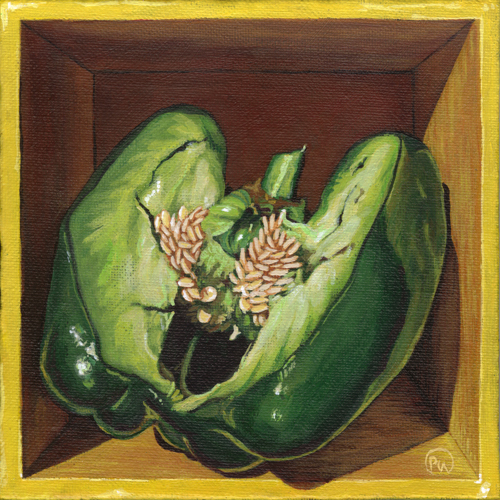 The shared thoughts and artwork of Pam Perras. Pam is a visiting artist from Wakefield, MA. 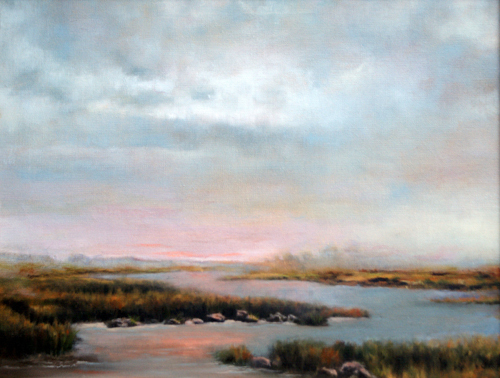 Her work will be on exhibit at the Melrose Arts Festival on April 26-28, 2013. Art gives me a chance to be highly aware and focused on subjects I love and wish to share with others. Nature, people, still life. Creating art offers a constant source of discovery about the world and my reaction to it. Sometimes it’s uncomfortable, frustrating. But, pair that with the amazing, “in-the-zone” experiences where all that is possible flows like music, I can’t help but love the journey. I love learning. Q. In your Bio you mention your love of painting outdoors – “hearing birds, feeling the heat or a cool breeze, the smell of water”. Do you find that these unseen experiences influence what you capture by sight? Yes, I do. All of nature, not just its visual qualities, affects me. I imagine that my emotional reaction to the sounds, smells, the temperature of air on the skin, influence me in ways I can’t verbalize. It all beckons to me! 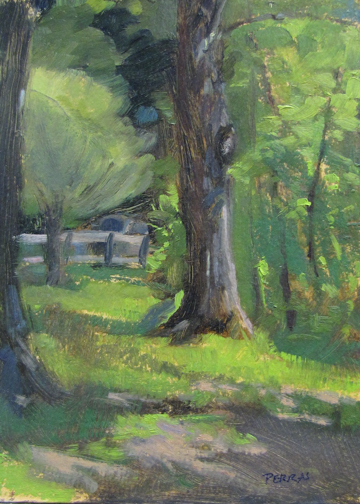 When painting outdoors, I find it exhilarating to create a painting during the short amount of time nature allows. It’s requires thinking on your feet and responding to nature in a very direct way. Q. Is there a time of day you find yourself always painting during? No. 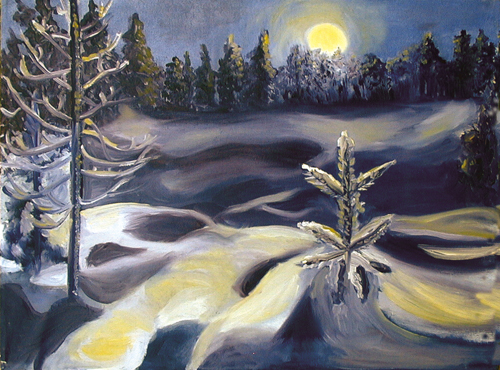 This winter I’ve painted in the studio a lot. My schedule allows me to paint during the day and focus on family and home in the evening, but I’ve been known to burn the candle at both ends! I paint nearly every day and have started to work on several paintings at once (but not always quickly). Q. Have you always loved to paint? I have always loved art in general, but have focused on painting the last twelve years. I was a graphic designer for many years (and still do it occasionally). I love to draw, have done collage and clay sculpture (for myself). Q. As a former art teacher, what do you feel is an important lesson to be learned? Art is such a great field, if learning excites you. No matter how good you are, you can always discover ways to improve. You learn from your own work and from others’. For whatever misguided reason, when I was in school many teachers would tell students, “don’t copy others, do your own work!” As a young artist, one of the best ways to learn is to copy masterful work, while also doing your own. 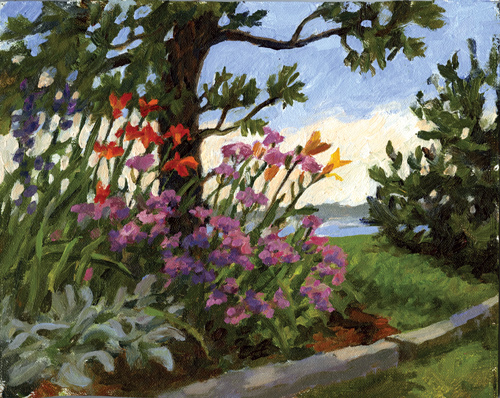 Study the techniques and compositions of master artists; you will eventually find your own personal style. Read about art history. Be an avid learner of all things—nature, science, humanities. Who knows how your artistic journey may be influenced? I enjoyed being a graphic designer because it also exposed me to many different fields and ideas. Q. Do you have any formal training? I would say I’m mostly self-taught. I did get a BFA in fine art (painting and sculpture), but the focus at the time was on abstract expressionism and conceptual art. Although I appreciate some of the great qualities to be found in abstract art, I would have preferred to master the traditional skills first. I have an MFA in graphic design. Some of the skills I learned for graphic design have influenced my art, I’m sure. I’ve taken painting classes and workshops in the past six years. Q. What do you do when you are not painting? I enjoy reading about all different things, including art; I love to garden, hike, bike, go to museums. 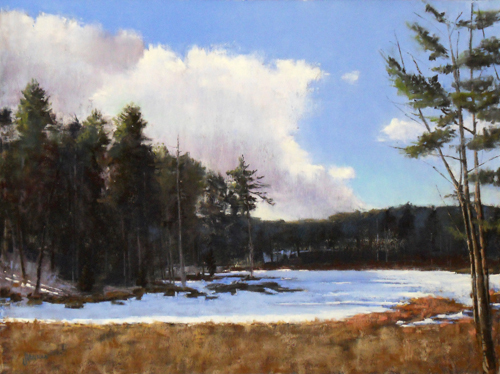 This winter, I’ve organized weekly figure/portrait sessions for a group of artists in my studio in Amesbury. In addition to landscapes, I have always loved painting and drawing people. I’m working on new ideas and will see where they take me. 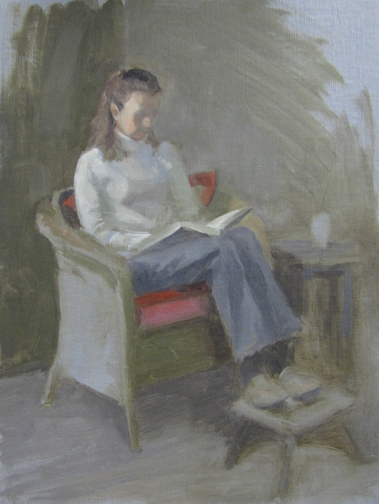 My goal is to explore figurative work, not necessarily become a portrait painter. I’ve been taking classes with Kelly Carmody, which has made me step back and address fundamental aspects of my work, like light/dark patterns, composition, modeling of forms. It’s a challenging time! 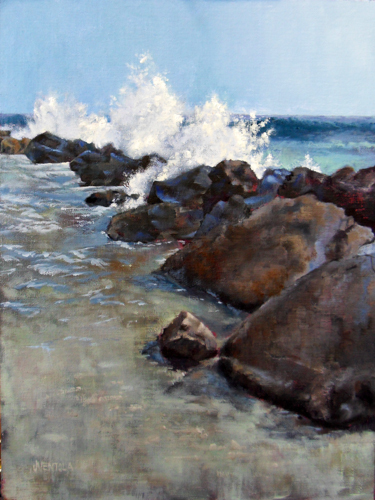 As a representational artist, I’d love to include beautifully turned forms in my paintings. I’m experiencing a bumpy learning curve these days, but it’s great! 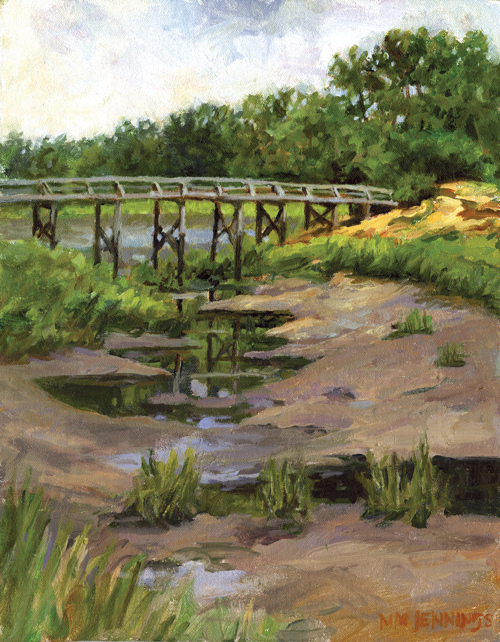 With the warmer weather, I’ll also be painting outdoors with a group of plein air painters called Band of Brushes. I’ve been a member for 6 years. Q. How do you relate art to life? I can’t separate the two, yet I’m still trying to figure out how to make more meaningful connections in my work. In everyday life, my family has posed for me and listened to my excited comments about nature, landscapes, skies. 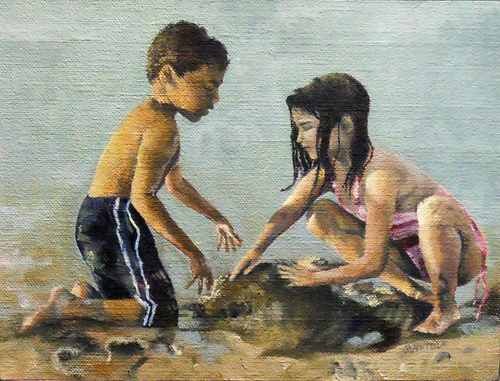 When my sons and their cousins were young, they were supportive and helpful, too—bringing me abandoned nests, bits of nature and hiking and enjoying the outdoors while I’ve painted.